The near to medium term supply-side picture is becoming clear, and it still centers on South American production, and what looks to be a major increase in corn & soybean exportable surpluses. In recent weeks AgResource has focused quite a bit on South America, including in our webinar for Midplains last week, and indeed time is running out to affect production there. The lack of drought this year has been important for soybean yields, and we’ve raised our Brazilian soy crop estimate in recent days to 107 Million Metric Tons, vs. the USDA’s 105 and vs. Brazil’s crop of just 96.5 MMTs a year ago. 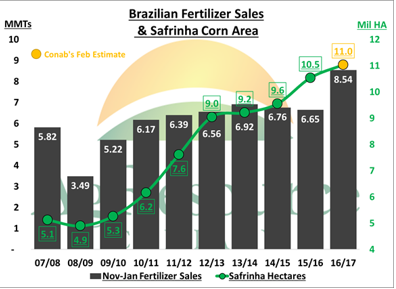 But it also looks to affect corn S & D. The graphic above charts Brazilian fertilizer sales against safrinha (second crop) corn acres, which are planted in Feb/Mar. Fertilizer sales have been much better than expected, and amid a rapid pace of soy harvesting - and so far rapid place of corn planting – the USDA and CONAB (Brazil’s equivalent to USDA) estimates look at least too low by 3-5%. Assuming normal weather Mar-May, Brazil’s corn crop is pegged at 87-88 MMTs, and Brazil’s exportable surplus will reach as high as 29-30 MMTs, vs. just 15 MMTs in 15/16. This is important, (Brazilian exports corn will double) and unfortunately for the US maintaining its recently found share of world trade will be more difficult beginning in July. 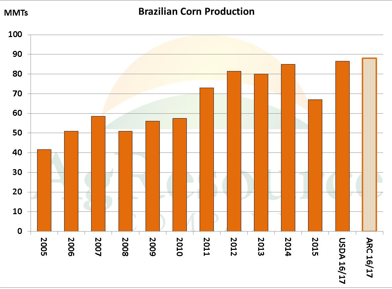 Brazil’s boost in production may even offset any potential weather issues in the US, and so we advise US farmers to use any test of $4.00-4.10 in the next several months to extend cash sales. So far in 16/17, the US market has been one of big supplies but also very big demand. We fear the market moving forward will be one of ongoing big supplies but shrinking demand. Simply put, South American weather has been much better than Jan/Feb of 2016. 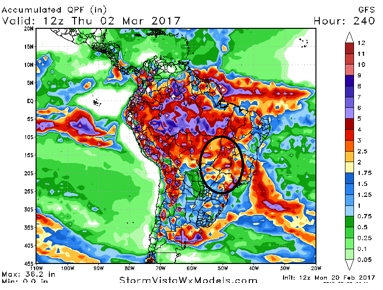 The 10-day Brazilian precip forecast is below, with safrinha corn belt highlighted, and there’s no sign yet of any adverse dryness.